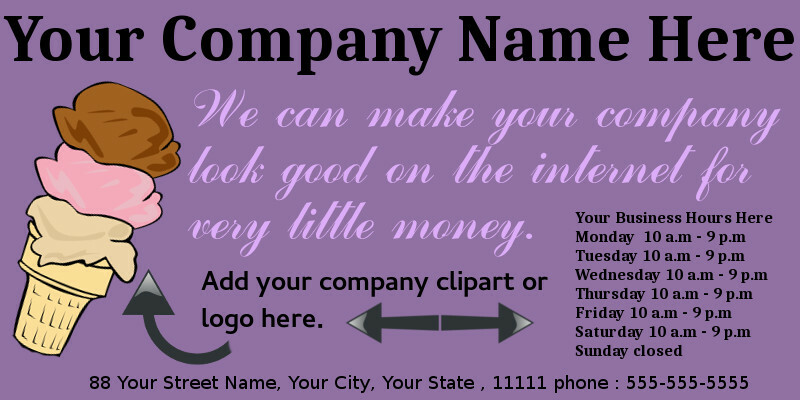 We can make your company look good on the internet. This site created in your company colors, with a custom designed header to meet your business needs. Most small businesses only need a few pages for their web presense. A simple three page site is the perfect solution. Use the main page as an introduction, to introduce yourself to your potential clients online. The second page can act as a product offering. The third page would be your contact information with a map. Here's a couple examples utilizing this website. A restaurant could put a picture of their restaurant on the first page, along with a brief history of their business, and maybe a little info about the chef. The second page could be a menu, either done in html or a scanned image of their menu, and the third page would be contact information like, phone number, map, address. A cleaning service, could have basic info on different cleaning packages, next page could be images of staff on the job, third page contact. I'm sure you get the idea and a simple three page site is perfect for many companies. The page you are on right now is your about page. Here you can place a small thumbnailed image of you or your business, and put any information you want about you or your company. Suggested information for a business would be who you are, what you do, how long you have been in business. Example:Welcome to the website of YOUR BUSINESS NAME HERE. Our company was founded by YOUR NAME HERE in 2001. Located in YOUR CITY NAME and STATE HERE, we specialize in the sale and production of widgets, do dads, knick knacks and what nots. Here you can add a little more fluff. Our what nots are second to none, and we make the best doo dads in the industry. We pride ourselves on customer service, and look forward to doing business with you. Stop in our showroom any time, or feel free to use our contact page and speak to a live represenative from our company. Thanks for taking an interest in YOUR COMPANY NAME HERE and we look forward to hearing from you in the future. This is just suggested text. You can write whatever you want on this page up to 1500 characters. Additional characters can be purched at an additional $1.00 in BTC per 1500 additional characters. The design of this site utilizes the most recent web standards for html5 and css. The design will work on most viewing platforms like smart phones, web browsers, and different operating systems like Windows, Mac, and Linux. We try to keep our designs scalable and functional for the many different ways your potential clients will view your site. Because we use the latest code, some old browsers may have a tougher time parsing some of the html, and some browsers that have not integrated the latest html standards may line up objects, or parse text differently. The good news is, that because your site is created with the latest coding your design will maintain a modern look, and not need upgrading for many years to come. Also should you decide you have out grown this small, basic web design, the design can easily grow with your business.